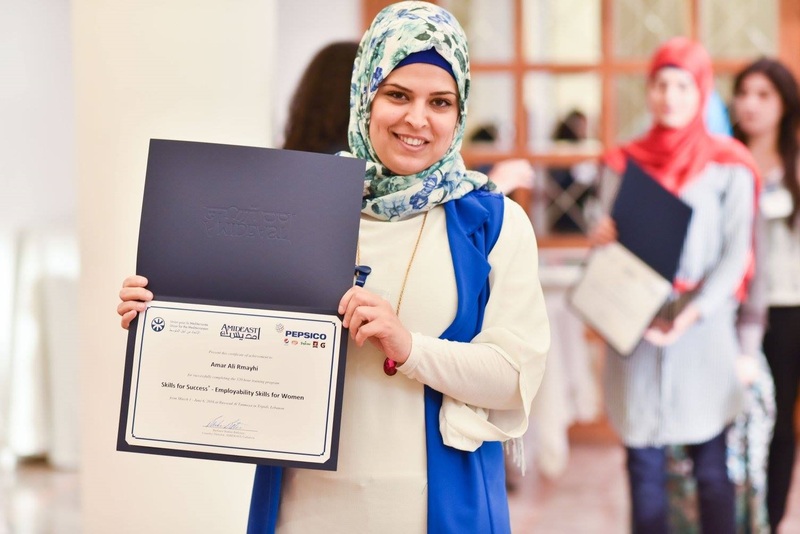 When AMIDEAST launched the Skills for Success® training program in 2014, its appeal was partly due to the adaptability of the program to fit the needs of varying countries and intended beneficiaries. Designed to address the region’s high youth unemployment rates, it has already benefited nearly 5,000 individuals in eight countries: Bahrain, Egypt, Jordan, Kuwait, Lebanon, Libya, Morocco, and Tunisia. As a scalable, customizable program, Skills for Success has proven to be effective for reaching trainees within the 16–30 age range, including underserved women, secondary school and university graduates, and those living in diverse settings and rural locations that are harder to reach. Three new iterations of Skills for Success are further demonstrating the value of its adaptability. Two programs, currently offered in Lebanon in partnership with Citi Foundation and Asfari Foundation, include entrepreneurship training to expand the career options of participants. The third adaptation, created with support from the Boeing Company, emphasizes academic and 21st century skills in order to advance the prospects of underserved Kuwaiti high school students for both higher education and employment. At the core of Skills for Success are transferrable skills such as English language and information communication technology (ICT), as well as workplace competencies in growing demand among employers in the region, such as problem solving, team work, and customer service. For women’s cohorts, topics such as personal safety in the workplace are also included. By honing participants’ understanding of the job market, ability to apply for jobs across different sectors, and preparation for professional success, the program further increases their chances of finding and keeping a job. In several of the programs, AMIDEAST has also included a “pay-it-forward” component, in which participants hold personal development and career awareness workshops with other youth in their own communities, for which they are trained and supported. Skills for Success programs have benefited more than 1,200 unemployed young graduates, nearly half of them young women in Egypt, Jordan, Lebanon, and Morocco who participated in iterations endorsed by the Union for the Mediterranean and supported by the International Labor Organization. Among those alumni actively looking for work, an average of 66 percent have found employment so far. Others are either still in university or continue to search for job opportunities. Among the women who completed the UfM- and ILO-supported iterations, 33 percent decided to continue their education due to the program. As a scalable and customizable program, Skills for Success allows AMIDEAST to work with different international and regional partners in support of mutually shared goals of expanding opportunities for youth and advancing economic development in the MENA. The initiative has attracted support from other partners, including government agencies such as U.S. embassies, the Norwegian Royal Ministry of Foreign Affairs, and the Flemish Department of Foreign Affairs, as well as foundations and corporate partners such as PepsiCo and General Electric. Among corporate partners, Morocco’s phosphates giant OCP Groupe stands out. Training centers operated by AMIDEAST on behalf of the OCP Foundation and Phosboucra Foundation have provided employability training modeled on Skills for Success to more than 3,500 Moroccan youth in the past two years alone.